International Conferences & Exhibitions to launch International Student Fest this November. September 07, 2016 – International Conferences & Exhibitions (IC&E), one of the longest-standing international exhibition houses in the Middle East, has announced the launch of the International Student Festival to ensure that students in the region have a common event that they can relate to as well as own. The move complements a recent industry survey, which forecasts that the number of students in schools and universities in the UAE will grow at an annual of 4.1 per cent to reach 1.4 million in 2020 from 1.1 million in 2015. The pioneering event will take place from November 24 to 26, 2016 at Meydan Grandstand and Convention Centre in Dubai. Specially designed for the UAE’s multi-cultural community, the International Student Festival will provide a central stage supplemented by displays, seminars, workshops to connect youth coming from diverse cultural backgrounds. The show aims to position itself as the annual confluence of discussions, debates and discoveries that facilitates dynamic, creative and competitive learning facilitated by inter-college competitions in sports, fashion, and culinary skills, among others. Aside from being beneficial to youth, the 2016 International Student Festival will provide a perfect platform for exhibitors to meet thousands of prospective students and develop personal relationships. In addition, it will provide participants with vast opportunities to display and demonstrate their products live on the spot to the audience as well as receive immediate feedback. UAE University signs memorandum of understanding with Supreme Legislation Committee. UAE, April 4, 2016 – The UAE University (UAEU) has signed a memorandum of understanding (MoU) with the Supreme Legislation Committee (SLC) to promote a joint action to uphold the role of the law in creating an integrated society based on mutual knowledge. Dr. Ali Rashid Al Noaimi is the Vice Chancellor of the UAE University, and H.E. Ahmad bin Meshar, Secretary General of the Supreme Legislation Committee. The two sides emphasized the concerted efforts to keep pace with ongoing developments as they have a positive impact on legal, research and academic works in the UAE. 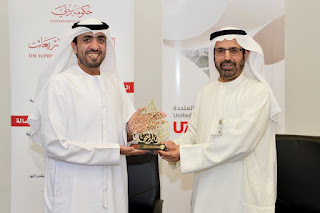 The MoU was signed by Dr. Ali Rashid Al Noaimi is the Vice Chancellor of the UAE University, and H.E. Ahmad bin Meshar, Secretary General of the Supreme Legislation Committee, in the presence of a number of officials from both sides. Dr. Al Noaimi stated that the UAEU has a major role in the development and prosperity of the UAE. It is constantly working to enhance the capacities of scientific research and innovation in areas of national and regional importance through partnerships with various community organizations. This reinforces the UAEU’s leading role in effectively contributing to the development of innovative solutions for addressing challenges to the society, which is reflected in the number of agreements and MoUs signed with various institutions of the UAE. The Vice Chancellor added that the cooperation lays a solid foundation for building a fruitful partnership that will make a valuable contribution in terms of the development of the legislative system. The aim is to improve the level of legal training for preparing a generation of professional talents that are capable of leading the process of legal excellence in the UAE. He pointed out that the UAEU is confident that the new partnership will be an important addition to its continuous efforts to achieve a distinguished status in international research by providing the community with scientific studies and research concerned with emerging issues related to local and international legislation and laws. H.E. Ahmad bin Meshar emphasized the importance of this strategic partnership in strengthening cooperation, communication and coordination between the Supreme Legislation Committee and the UAE University to serve the public interest at the federal and local levels. He pointed out that the agreement is an important qualitative addition to the vast network of strong relations between the Committee and prominent local, regional and international bodies concerned with legal and legislative affairs. He further said that the new MoU is focused on innovation, enriching knowledge and encouraging optimal investment in training and serious research which is a fundamental pillar for the development of the legislative process in line with the continuous development witnessed by the UAE at all levels. “We are delighted to cooperate with a prestigious academic institution such as the UAE University, which shares our vision of enriching and transferring legal knowledge and stimulating innovation, creativity and excellence in legislative and legal work. We are upbeat about our new partnership which will be a major boost for our tireless endeavors to create an integrated legislative system. This new system will support sustainable development plans, embodying the vision of our wise leadership to attain a leading position in the world,” H.E. Bin Meshar added. The two parties revealed their plans to open new channels for the exchange of ideas, proposals, and creative and innovative programs to serve the goals centered on strengthening the legislative and legal infrastructure. In addition, they will work to effectively contribute in fulfilling the objectives of the National Innovation Strategy to make the UAE one of the world’s most innovative countries over the next few years. Believing in the importance of integration in the process of elevating legal and research performance levels, the two parties agreed to cooperate in the field of legal training with a focus on providing the students of the UAEU’s Faculty of Law with the best relevant training programs in drafting legislation as well as preparing and disseminating specialized legal researches.